I've still got more lovely embossed metallic cards to share but I thought we'd take a little break and look at another technique with embossing folders. 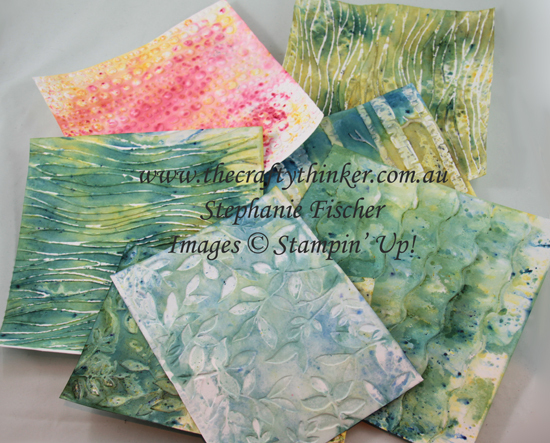 Inspired by Kelly Acheson's entertaining video, I played with Brusho Crystals and a variety of embossing folders. With just a few minutes of fevered activity, I ended up with a lovely pile of backgrounds. 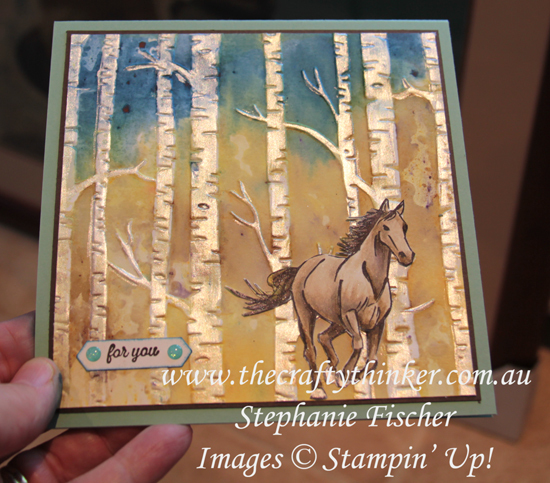 My favourite one used the Woodland embossing folder. I sprinkled the Brusho onto the side with the Stampin' Up logo and started with a touch of blue (it's very intense, so a little goes a long way) at the open end and then randomly sprinkled Yellow and Moss Green over the rest. I spritzed very lightly with water to start activating the crystals. Then I spritzed quite generously with water, angling the direction of the spray so that the blue was encouraged to blend down into the yellow and green. I placed my piece of Whisper White cardstock carefully onto the wet, inky side and closed the folder before running it through the Big Shot. 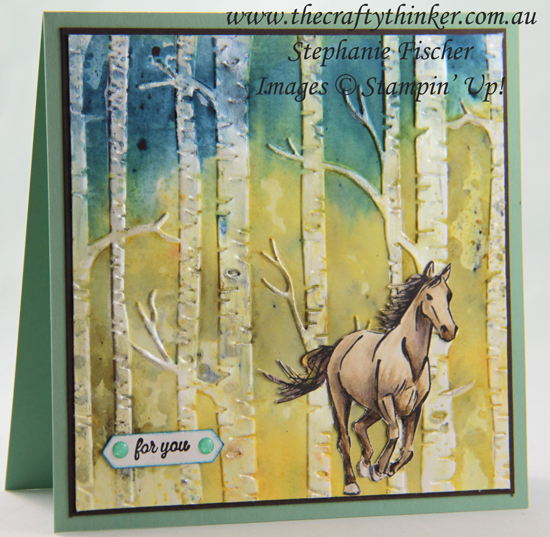 This gorgeous horse is crashing out of the woodland at full tilt! Once the piece was dry, I used a dry brush to lightly run some Frost White Shimmer Paint over the tree trunks and branches. This produced a wonderful shimmer that's, of course, really hard to capture in the photos! 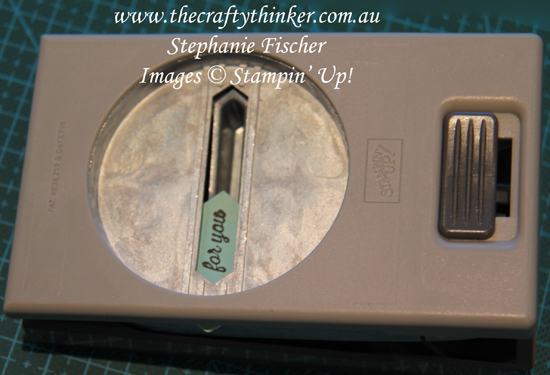 The base card is 5.75" square and I trimmed the embossed piece to 5.25" square. 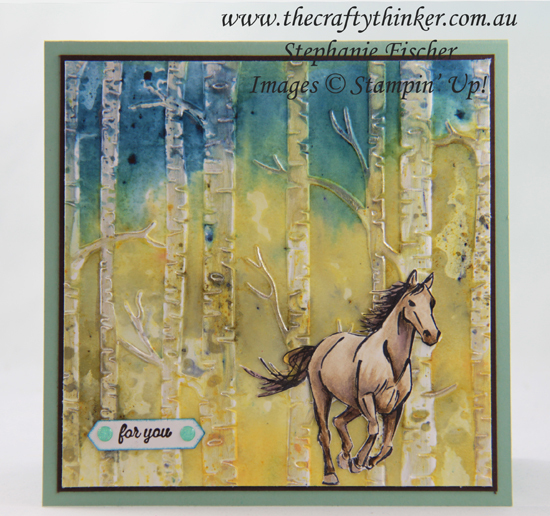 I stamped, watercoloured and fussy cut the horse image from the Let It Ride stamp set and cut out the sentiment with the Classic Label Punch. I then adjusted the size of the label as explained below. I also added some dabs of the Frost White Shimmer Paint to the hooves, edged the label with Pacific Point ink and added some Glitter Enamel Dots. I was like a contortionist all around my craft room, trying to capture the glimmer of the trees in a photo! I'm sure you'll be seeing the other backgrounds on future cards. At the moment they're sitting in "background corner" but sooner or later I'll get around to using them! Punch the label as usual. 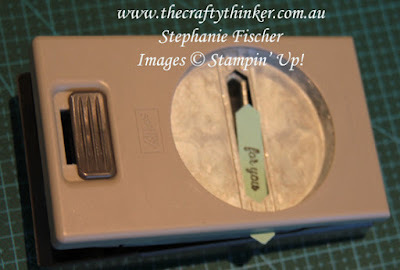 Alternatively, stamp your greeting towards one end and just shorten the other side.